R. Yosef Braun, the winner of the September 2010 elections for a 3rd Rov, is being sued in the New York State Supreme Court on allegations of fraud and defamation. This comes after refusing multiple summonses to Din Torah. 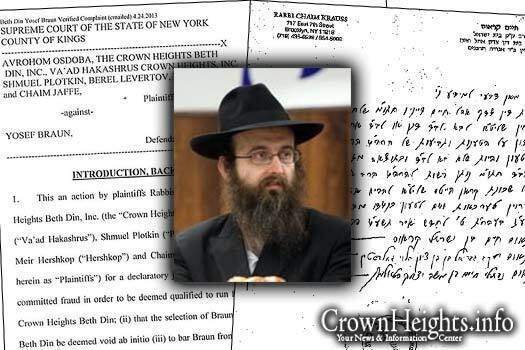 The plaintiffs in this lawsuit – the Crown Heights Beis Din, Vaad Hakashrus of Crown Heights, Rabbi Avrohom Osdoba, Berel Levertov, Shmuel Plotkin, Meir Hershkop and Chaim Jaffe (on behalf of the community of Crown Heights) – are suing R. Braun for fraud pertaining to his candidacy and subsequent election to the Beis Din of Crown Heights, and defamation based on letter he circulated calling the quality of the CHK’s Kashrus into question. 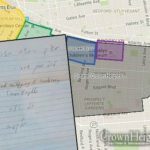 the twelve page complaint was filed last week after Rabbi Chaim Krauss, Rabbi Yaakov Gavriel Goldstein, and Rabbi Naftali Chaim Salamon – three Dayanim from the Boro Park based Beis Din Tzedek Ohel Chaim, signed a letter giving Rabbi Avrohom Osdoba and the members of the Crown Heights community permission to bring their claims before a secular court – due to R. Braun’s refusal to answer any of their three summonses. Last week the same Beis Din issued a letter giving Rabbi Osdoba and member of the Crown Heights community to seek remedy to their claims against R. Braun in secular courts, since he refused three summonses to appear before their Beis Din – or any other Beis Din that he could have chosen. 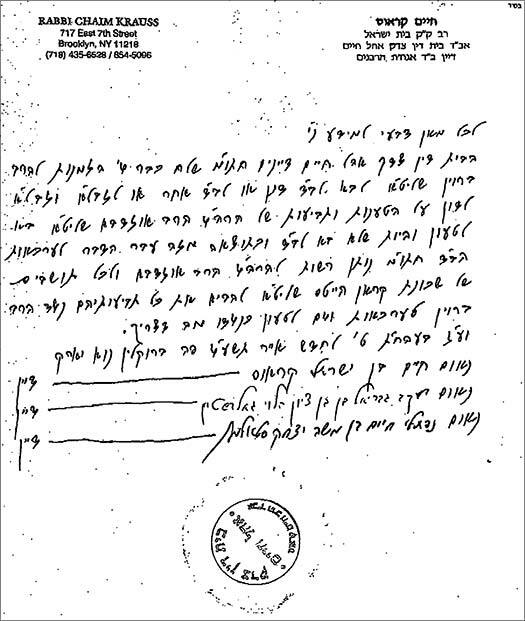 The letter from the Ohel Chaim Beis Din giving permission to take R. Braun to secular courts. This lawsuit outlines the three years since the contentious elections for Rabbonim was held, in which R. Braun defeated Rabbi Moshe Bogomilsky by a margin of 98 votes. The action goes on to detail how R. Braun along with his cohorts publicly destroyed one of the questionable documents that he used to substantiate his claim that he did have Rabbinic ordination. Based on these claims the action seeks to invalidate the election of R. Braun ‘ad initio‘ – from the beginning – as if they had never taken place, due to the fraud. 45. Specifically, Braun published a writing to third parties (i.e. the Crown Heights Jewish community) referring to the Crown Heights Beth Din and Va’ad Hakashrus, that stales that one should not rely on the various propaganda and promotions, as those publicizing them (i.e. 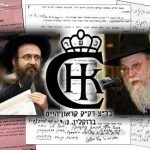 the Crown Heights Beth Din and Va’ad Hakashrus), are not adhering to the ruling of the Torah. 46. The above statements by Braun are false, defamatory, and disparaging and were known by Braun to be false, defamatory and disparaging when he made them and were made by Braun in order to injure the Crown Heights Beth Din and Va’ad Hakashrus and divert business to himself. Braun published the above referenced statement with malice. Braun was not privileged in publishing the aforesaid statement. This lawsuit – which was given the go ahead by three Rabbonim – is in stark contrast to last lawsuit that was filed by Zaki Tamir, Fishel Brownstein and Elie Poltorak in April 2011 where they sought, against the instruction of Rabbi Rosenberg, to enter the Zablo’s Psak Din in court. While I realize that there are issues to be resolved, I am wondering where the legal fees for this suit are coming from? Is this the same Braun that has defended the terrorist Tzfatim? Boy, what comes around, goes around.. Put the so called rabbi in jail immediatement. This, along with actions from the other side, CANNOT bring any positive outcome to our Shechuna. The only ones who will possibly benefit from any of this are the lawyers collecting fees. Why don’t people stop and think things through? Think about the possible outcomes, whether the court will rule for the plaintiffs, against them, or (IMHO the most likely outcome) find a way of not getting involved. What would be next in any and each of those possibilities? Will it bring benefit, prosperity, or peace to our Shechuna? Will any of these outcomes bring about more respect for ANY of the rabbonim involved (Braun, Osdoba, Schwei, or Segal)? Will any of this help increase Yiras Shomaim in our schecuna? Will any of the parties involved be able to say “Yodeinu Lo Shofchu Es Hadam Hazeh” for any boy or girl from our neighborhood who stops keeping shabbos, or lowers their standards of kashrus? The only possible outcome of the current actions taken by either side, is a grave loss to the community!!! Stop the madness! Let some adults in the room take control and lead something constructive rather than destructive. YOU ARE TOTALLY CORRECT – BUT YOU ARE ALSO INNOCENT. I AM SAD FOR YOU AND FOR ALL OF US. BRAUN IS A SLIME – IS WAS AND ALWAYS HAS BEEN AND HE SHOULD BE OUSTED ASAP- HE CAME TO FIGHT AND TO OUST OSDOBA – BUT AS SOMEONE MENTIONED WHAT GOES AROUND COMES AROUND – GO BACK SOME 20 YEARS AND YOU WILL FIND THAT THERE WAS SOME UNHOLY STUFF THEN TOO. BOTTOM LINE WE NEED MOSHIACH!!! THESE GUYS ARE NOT ONE BIT CONCERNED FOR OUR KINDERLACH!!! PEOPLE GO TO THEM WITH SHAYLOS AND USE THEM FOR SIDDUR KIDDUSHIN?! WE REALLY ARE ORPHANED – BUT ARE STILL OBLIGATED TO INCREASE IN MITZVOS AND MAYSIM TOIVIM IN SPITE OF OUR TEMPORARY SITUATION. WE HAVE A TORAH AND THAT IS OUR GUIDE.. LET’S KEEP IT AND BRING MOSHIACH!!!! from a cursory reading of the paragraphs quoted (19, 22, and 24) it seems like the suit is being brought against the wrong defendant. If anyone, it is Rabbi Rosenberg who should be sued! He is the one who charged large sums of money to serve as a mediator, heard arguments in a selective manner (I know because I tried offering an argument to him and got an e-mail response from him). Changed his own rules (he approved Braun’s candidacy prior to the election knowing that he was not yet 40), and came up with a seemingly unworkable solution on which he refuses to follow through. First of all, 20/20 Thank g-d almighty Rabbi Bogomilsky didn’t “win” that elections*. The corrupt cabal of Mossrim would have made his life a living hell (with harassment and Mesira). *Rabbi Bogomilsky came out to be the bigger winner by losing that “elections”. Second of all: There is no doubt in my mind that the corrupt cabal of meshichist mossrim cheated their man in. Rabbi Bogomilsky has been a Rov in this neighborhood for over 40 years. It doesn’t make sense that a nobody like Braun was able to “win” this elections, especially when introduced a mere 13 days before the elections. All this is past and irrelevant to our day to day life. What I am truly interested in discovering is how the corrupt cabal at the Crown Heights Jewish Community Council, Inc. spent over TEN MILLION DOLLARS that they received by way of government grants and contact since 2009. David Abramson is the most incredible lawyer in the world- a true lawyer of the Rebbe and a gift to the Chabad community. The first two counts seem plausible enough, at least to withstand initial scrutiny. I don’t see how the 3rd count (defamation) can possibly stand. The allegedly defamatory statements are a psak din, i.e. a religious opinion, and therefore core protected speech. If Braun believes that CHBD’s hechsher is, as a matter of halacha, invalid, he is entitled to express that belief, no matter how he came by it. Even if it was a dream he had, he is entitled to shout it from the rooftops. The fourth count (defamation against R Osdoba) is on more solid ground, if an ordinary person on hearing the alleged statements would understand them to mean that R Osdoba had literally engaged in forgery. But an obvious tack for the defense to take would be that nobody would understand it that way, and that everyone would understand that he was really accusing R Osdoba not of literal forgery but of usurpation, which he can claim to have reasonably believed to be true and thus not actionable, especially since R Osdoba is a public figure at least in this context. Also, without R Bogomilski as a plaintiff, the first two counts may fail for lack of standing. Why no index number on the complaint please update so we can follow the developments in this. Isn’t it interesting that that once R’ Braun left Sydney, that schuna became MORE Achdus! Crown heights deserves what it gets. i did nothing to deserve this. it seems to me that opinions/mindset/lifestyle like these are what creates problems like this and/or amplifies, worsens, and aggrandizes them. It’s about time this unkempt, sleazy little man is tossed out on his ear. He’s a fraud. If he gave me a psak it’s sunny I would take an umbrella. This entire affair is a shame and you, CH.I, should not be a party to it even if it is just publicizing the sordid details. why dont I give a hoot anymore? Right on! And Rabbi Cunin is the epitome of peace and harmony. Na, no trouble there at all. What are we learning from all these rabbonim? What an example for our kids!! Forget about your money | yeshus. ! Look T the real picture! Only lawyers benefit from this! And all the community loses! But obviously any looks qualified for these positions! Why didn’t you ask my father-in-law to take the case?…???? O that’s right, I’m sorry for suggesting it, but I forgot that my father-in-law (paul) never won a case. But maybe this would be the first, as there is always a first for everything…. O, and let me not forget the legal fees, ah that’s not a problem, between all the stores in ch, I can steal it all, don’t worry! Boruch Hashem. Braun and his friend Yossi Marlow have worked to destroy families against halacha, in submission to modern orthodox activists (who now rally against bris milah kadas – which in fairness Braun and Marlow are on our side on). They have hurt husbands who want postpartum evaluations before making lifelong decisions and encourage couples to fight it out in civil court, do nothing against mesirah, etc. Yaakov Shwei is a fellow traveler with them and an am haaretz gomur who also cares little for morality. Mitzvoh lefarsem oiseh mitzvo – Rabbi Osdoba and his son are men of gold who are rare in this world and can be trusted on (at the very least) these issues. Let’s not kid ourselves, the answer is not Rabbi Bogomilsky or any of his close supporters. Why not take a Rosh Yeshiva, a long standing magid shiur, someone who will not psak based on political correctness and who knows to stand their ground on all issues for Hashem and for Halocha Psuka. Please have Rabbi Braun resign so we can get a new Rav. It did not work out his being Rabbi. The only Rov in Crown Heights with real shimush (from Rabbi Dworkin A”H and Rabbi Hecht A”H and Rabbi Marlow A”H) is Rabbi Moshe Bogomilsky. We dont a magid shiur or rosh yeshiva. We need a rov with experience. Rabbi B is also well regarded outside the Lubavitch community. In our community he is very busy with calls from Crown heights people and shluchim. All these qualities are way above all the other newcomers. There are B”H rabbonim who could serve together with Rabbi Osdoba with no problems and who the community would be richer for in general. There are plenty of older maggidei shiur who would do a knock up job. Rabbi Zinner (Notei Gavriel) could be persuaded. Why not entice either Rabbi Shusterman (LA), Schochat (Toronto or LA) or someone else who can ignore insanity and paskin al pi din instead of a puppet from Sydney? Someone should care about halacha as it is written. The future of Judaism is at stake. Braun in his first speech said this “es vet gissen blut, ober shalom vet zein”. translation: “Blood will be spilled, but there will be peace”. So far he got the first part right. Lets hope we get to see the second part. 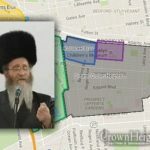 It seems most fitting that Rabbi Braun should step down or at least have a second vote to determine who the Crown Heights community really wants as Rov. can everyone please keep their comments to themselves? putting down rabbonim is not something that should be done, especially not on the web. Mr. Braun doesn’t know the price of fraud? Let him go back to kindergarden and relearn it. The same goes for all who promote fraud and deception. Truth will surely win out, but why do so many innocents have to suffer? Quit now and stop the damage you are causing. Are you saying that the Schuna in Australia have more Achdus now since he left? That’s the way I understand it. Because C”H got all the Machlokeses now…. Unfortunately it came to this Mr. Braun is a terrorist by himself & a clear phony who fooled many & should never have been elected. Yes he might know how to learn & give a shiur but there are many people who B’H can also do that does that mean they should be a Rav? the many is a liar a phony & left Rav Osdoba etc. with no choice. Like Rav Osdoba or not He is a real Rav well Qualified & has been for over 30 years Did His Shimush Under Rav Zalman Shimon Zatza”l Received the Rebbe’s Approval & Brocha as well as the Koach That the Rebbe gave the Bais Din. Mr. Braun? a phony & a liar from day one. Inmy opinion they should have included Rosenberg who was a fraud took The Shcunah’s money & ran! 1. I can’t understand why this means anything to anyone who has a life. 2. who in their right mind would want to take the post of “leader/rav” in CH? Comment #3, well said! That ought to be printed out and posted on every lamppost and wall in the neighborhood. What is wrong with you yidden in New York? Have your brains turned to mush? “Yisbareru Veyislavnu Hadevarim!” When the dust settles, hopefully, we will finally be able to put to rest the past 19 years of machlokes and confusion. Harbeh Shluchim Lamakom-If it takes a Judge on Adams St. to make a seder in Lubavtich, so be it! Unfortunately, the machlokes over the past 19 years has proven that we cannot work things out on our own. Give the US judicial system a chance, we can only gain. The Beis Din can send summonses and, if ignored, approve the matter be taken before a secular court. After a claim is initiated in court, either side can go to a Beis Din for a ruling that the same matter be taken out of court and brought before a Beis Din or Zabloh. This Beis Din’s authority is afforded to them by those who accept it. Anyone who seeks a Beis Din can go to whichever they choose. The point is, this affects a few individuals who are involved. It simply is politics. Besides for Rabbi Osdoba, are the people bringing this lawsuit even representatives of the community?! On another note, if Rabbi Rosenberg presided over the zabloh which decided the qualification for candidacy, he surely is the one to decide to what extent the qualifications apply, after all, the qualifications in the first place are up to the zabloh Beis Din not the baalei din. Either way, until there is a ruling to the contrary, all the present Dayanim are Dayanim, respect them accordingly. Furthermore, after all is said and done, the community voted for these Dayonim. Frivolity leads to loshoin horo leading to mockery of Rabbonim and then lack of Emunah in Hashem. Recognition of Divine Providence leads to awe of Heaven and joy in one’s portion. I second the Rabbi Shusterman name. If he could be enticed to come to New York… Halevai. he has eideleh erlicheh relatives in other chassidishe shechunas, it would be wise if we act like erliche yidden as well, and think with our heads about this. Is it FACT or FEELING. This sounds really just too weird, I cannot believe this. Yidden, save yourselves, us, and really think carefuly before you act so thoughtlessley. There are other ways to get excitement and meaning in your life.HaShem zol helfen, and the Rebbe should help us. fact is, that after Braun being here so long what has he done or accomplished. did he take care of the poor? NO. did he take care of the sick? NO did he make sure that all families have food on the table? NO did he make sure that all children have where to go in the summer? NO and the list goes on. the only time you hear or see his name, is when there is a letter of Machloikes, be it against the Current Beis Din, or a Moshiach issue, or the Parade. we are dealing with a guy who rolls out of bed at about 10 o’clock, davens at the 12PM minyan. literally is not capable of doing anything. had he been capable he would have remained in Australia. in addition to never paying his bills on kigston, camps, and yeshivos, he is a good for nothing, i understand that it is okay not to have money or afford to pay your bills, but he found money to buy a new home for $875.000 cash. and BTW Braun won the election by disguising who he relay was, he instructed that there should be NO yechi on his promotional material, he hid the fact that he had NO smicha, never mind that there was clear instructions from the rebbe that CH should not take a rov from out of CH. Normal, respectable Rabbanim like rabbi Schusterman, Rabbi Schapiro or Rabbi Bogomilsky don’t want the job. The reason is simple: this community is divided beyond repair. It’s like the old days in the Wild West, total lawlessness. Just look what those Tzfatim did on Lag B’Omer to the bochur’s things. No one deals with them either. Its insane. But if you scream Yechi it doesn’t matter. Anyhow I hope Braun gets what he deserves. Send him back to Sydney….oh wait. THEY DON’T WANT HIM BACK!! Bummer. The main reason there were so few candidates was the requirement that it be a full time job. Anyone who needs to work for a living understood that they could not depend on the income from this position, and therefore could not afford to give up their current job for it. That’s why the only candidates were a rich man who has enough to live on even if he never sees a penny from this job, and someone who was already having trouble with his job and was looking around for something else. If they had made it a part-time job like the two existing rabbonim have, there would have been many more candidates, who could afford to cut back a little on their day jobs but still have an income to live on. If they thought that there was too much work for a part-timer, then they could have expanded the BD to five, and held an election for three part-timers. Enough! All people do in Crown Heights is fight! Fight each other, fight your fellow Jew, fight the Meshichisnt, fight the antis, fight the Rabbonim, fight each and everyone! The Rebbe’s call for achdus and ahavas yisroel, whatever happened with it?!!!! I don’t want to hear no loshon hara, no motzi shem ra, no sinas chinam. Enough with the fights, the lawsuits, the letters distributed around the community! I’ve been nearly 20 years in the Shchuna and this scenario keeps repeating. It has never been right, and I’ve had more than enough. The Rebbe’s words are not empty words, we have gone around the world bringing Yiddishkeit to the farthest Jew, why can’t we stop the fights here, in our own backyard, and once and for all see Moshiach revealed through love and kindness for one another!? What credentials do Braun bring to our community. Has he done anything positive for the shchuna? I must say no. The latest thing was he made a matzah baking in a Satmar bakery with flour from Lakewood. In the end they were left with a lot of matzah which had to be sold at $5.00 a pound. Big chutzpa that a Lubavitch website is writing about it! So many teenagers are reading your site…You are responsible to show only the positive in Lubavitch! A shame on You!!! It is YOUR shtetel mentality and mindset that allows child abusers and predators (I know… radical leap) to continue to thrive without consequence. Corruption, lies, deceit all need to be brought all the way out into the open and dealt with appropriately. Hiding it and painting a ‘koombaya all is good in lubavitch’ picture will never solve anything. Heres another idea, how about not shooting the messenger and attacking those (Braun, Schwei, Osdoba) for causing all this? It’s better to be inform. Not sweep things under the rug. For some odd reason some of the commentators are making this about Rabbi Bogomilsky. This has nothing to do with Rabbi Bogomilsky he is too smart to get involved in this stupidity. Bottom line is the community has to have some self respect and clean up this mess. Rabbi Braun does have a duty to answer for his actions. He had the ability to go to the Beis Din its shameful and if anything entirely his fault that we are now forced to be in court. this is an embarrassment to the entire community and must be cleaned up. Braun should now turn around and sue the people who tricked him into believing that they were the majority in Chts. They “proved” it by fudging the election. (Was Rosenberg on the take under the table to facilitate the outcome? He certainly isn’t a member of Soney Betza.) So he arrived on a high horse. Has anyone noticed that there is not one comment here that rigorously defend him (his character)? Perhaps because his only supporters don’t read or write English. Al pi din, the only way the community can “get rid” of him, is to make life unbearable here. Perhaps this legal action will accomplish that. I think we should in fact sue anyone who has a problem with any kashrus.